Avy savvy backcountry skiers and riders know that three things count when it comes to the terrain’s influence on avalanches: the slope, the elevation, and the (compass) aspect. And Steve's Avalanche Inclinometer delivers all three. Sure, you can find plenty of inclinometers (also known as clinometers) that are designed for carpenters, but the Avalanche Inclinometer is meant for people who spend time in avalanche terrain. This app shows the slope, elevation, and aspect in BIG FONTS which are perfect for tired eyes in stormy (or too-bright-and-sunny) weather. And it doesn’t display a gaggle of tiny buttons and widgets to decipher when you should be skiing. When you have your phone aligned with the slope, a single tap on the screen will lock the data so you can read it. 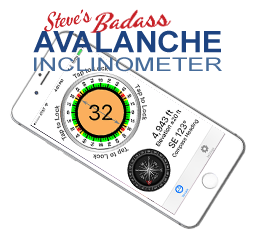 The Avalanche Inclinometer will even speak to you as you’re measuring the steepness so you don’t need to look at the screen. And the big inclinometer dial changes colors based on the slope which provides instant feedback on how the steepness of the terrain is contributing to the likelihood of an avalanche. After measuring the slope, you can tap a single button to share your current GPS location, the slope in degrees, and the elevation in feet or meters. The email includes kml and gpx waypoint files and a link that allows you to quickly see the location in any browser. You can enter the email address one time and the Avalanche Inclinometer will remember it for next time. Less typing; more skiing. 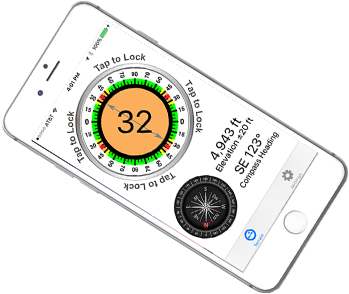 The Avalanche Inclinometer isn’t free, but apps don’t grow on trees. It will cost you less than the cost of a beer at a typical ski resort—think of it as buying Steve a beer! 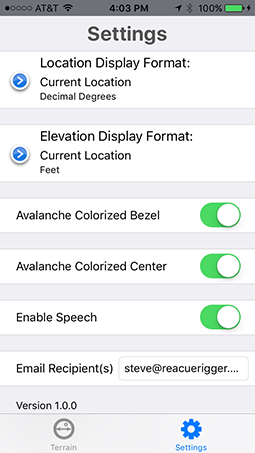 In addition to this app, it is important that you take an avy class, pay attention to the avalanche red flags, use good route finding techniques, and practice your avalanche rescue skills frequently.